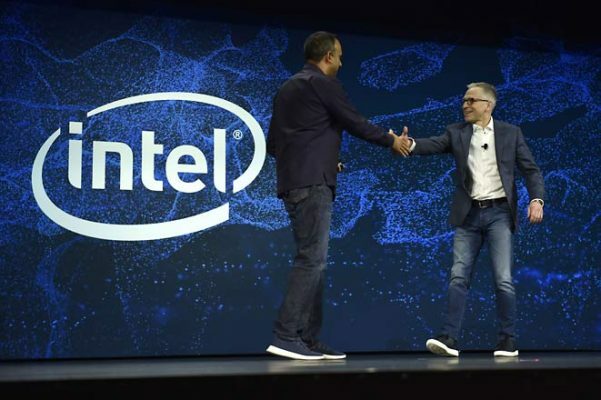 Intel Executive Vice President and General Manager Data Center Group Navin Shenoy (L) and Wrnch CEO Paul Kruszewski greet on stage during an Intel press event for CES 2019 at the Mandalay Bay Convention Center in Las Vegas, Nevada. Las Vegas: Intel and Facebook are working together on a new cheaper Artificial Intelligence (AI) chip that will help companies with high workload demands. At the CES 2019 here on Monday, Intel announced “Nervana Neural Network Processor for Inference” (NNP-I). Facebook is also one of Intel’s development partners on the NNP-I. Navin Shenoy, Intel Executive Vice President in the Data Centre Group, announced that the NNP-I will go into production this year. The new “inference” AI chip would help Facebook and others deploy machine learning more efficiently and cheaply. Intel began its AI chip development after acquiring Nervana Systems in 2016. Intel also announced that with Alibaba, it is developing athlete tracking technology powered by AI that is aimed to be deployed at the Olympic Games 2020 and beyond. “This technology has incredible potential as an athlete training tool and is expected to be a game-changer for the way fans experience the Games, creating an entirely new way for broadcasters to analyse, dissect and re-examine highlights during instant replays,” explained Shenoy. “We are proud to partner with Intel on the first-ever AI-powered 3D athlete tracking technology where Alibaba contributes its best-in-class cloud computing capability and algorithmic design,” said Chris Tung, CMO, Alibaba Group.